Both Governors of Shiga Prefecture and the State of Michigan signed the Agreement to establish JCMU. The Opening Ceremony of JCMU was held in Maibara, Shiga Prefecture. “Japanese Language and Culture Program” and “English Language Program” started in the temporary school building (Cultural and Industrial Exchange Hall of Shiga) in Maibara. The JCMU Grand Opening Ceremony was held at the new facility in Hikone. Prince and Princess Takamado visited JCMU and had a pleasant talk with students. The Summer Intensive Japanese Language Program started. The Lieutenant Governor of State of Michigan visited JCMU. The Sister States/Cities Conference was held as a part of JCMU 5th Anniversary. The Director of the Dept. of Commerce Japan Office in the State of Michigan visited JCMU. 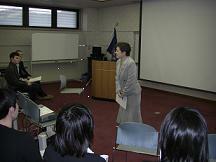 The Japan-U.S. University Presidents’ Symposium was held at JCMU. The Governor of the State of Michigan visited JCMU. The JCMU 10th Anniversary was held. JCMU and University of Shiga Prefecture (USP) formally established a practical agreement. The Detroit Symphony collaborated with Kosei Senior High School Brass Band in Shiga at JCMU. The Lieutenant Governor of the State of Michigan visited JCMU. The Environmental Sciences in Japan Program started. The Japanese Culture and Society May Short Program started. The Shiga-Michigan Joint Symposium 2001 were organized with USP. Maibara High School Intensive English Course began. Shiga University and the JCMU Consortium signed the Agreement for Student Exchange. The University of Shiga Prefecture (USP) and the JCMU Consortium signed the Agreement for Student Exchange. The 15th anniversary events were held. Governor Granholm of the State of Michigan visited JCMU. JCMU supported MEDC’s booth at the 10th Biwako Business Messe for the first time. Governor Kada of Shiga prefecture visited JCMU. 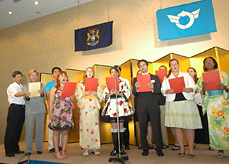 The 20th anniversary events were held in Michigan. Shiga University of Medical Science and the JCMU Consortium signed the Agreement for Student Exchange. The 20th anniversary events were held in Shiga. Comparative Health Care course started. Copyright © THE JAPAN CENTER for MICHIGAN UNIVERSITIES. All rights reserved.